Last week the Miami-Dade County Commission, in response to public feedback, voted to modestly raise property taxes to avoid having to cut library services. In a world of immediate information and at-your-fingertips Kindle novels, a survey in Miami-Dade County suggests public libraries remain relevent and popular. The survey found 80 percent of voters would oppose a significant cut to the county library’s budget – even if that means a reallocation of tax monies away from other services. The survey interviewed 5,200 registered voters – 400 of each commission district. Interviews were conducted in English, Spanish and Haitian-Creole. Opposition to library budget cuts in each district ranged from 69 percent to 85 percent. Commissioned by the Greater Miami Chamber of Commerce with support from the Knight Foundation, the survey found that when told the budget deficit could be upwards of $20 million, 67 percent of respondents said they still wanted the county to preserve library funding, either by increasing the library portion of the property tax (34 percent of respondents) or by cutting spending on other county services (33 percent). According to the survey, 22 percent of respondents favored cutting library to cover the deficit and 11 percent offered no opinion. And the county commission heard its constituents loud and clear. 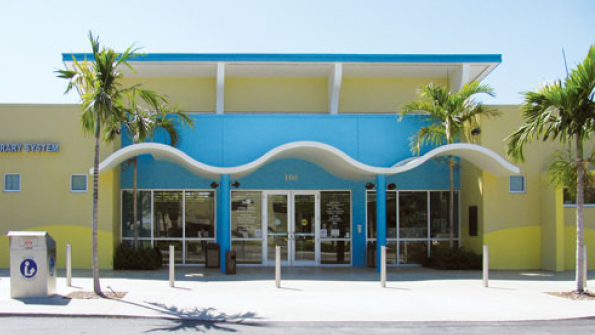 On Tuesday, July 15, the commission voted to modestly raise the property tax rate ceiling to avert library layoffs, according to NBC Miami. CBS Miami reports under the proposal the county’s library system would get $53 million for the next fiscal year without any staff cuts. However, this may come at a price to other services such as police and transit. In his proposed $6.2 billion budget, Miami-Dade Mayor Carlos Gimenez called for no new taxes, according to CBS. The commission's vote comes despite this mandate. To deal with budgetary shortfalls, Gimenez is asking for the county’s unions to give concessions on benefits and compensation to keep from having to lay off employees. Yes of course our community supports continued funding and additional resources for our libraries. These facilities are where all of our children, the future workers and leaders of our nation, spend hours and hours of time learning about the very basic principles of knowledge, science, arts and the world. Many in these communities are also becoming familiar with libraries being fully connected for quality research and distance learning. If a Chamber wants to do something to help the community, it should fund an initiative to identify resources to finance and expand the libraries and transit. This makes much more sense and is far more meaningful than charging chamber members for worthless I’m lonely lunches, fly-ins, trade missions and junkets advertised by email blast campaigns.